Do you know what steps you would take if someone you knew were the cause of a fire? Or a stranger? Do you know what quick steps you could make to save someone’s life or your own? A top goal of ours is to promote residential and commercial fire safety along with fire prevention, but fires occur nonetheless. 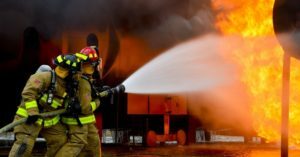 You may know all of the steps on how to prevent a commercial fire and protect your business. You may regularly check your smoke and carbon monoxide detector and may clean the dust in your home. You could even be cautious about how you cook your food to prevent grease fires. However, do you know what steps you would take if someone you knew were the cause of a fire? Or a stranger? Do you know what quick steps you could make to save someone’s life or your own? Keep reading for five steps that you should take to protect someone or yourself in a burning building. Cellphones are great and convenient because they travel with us. In the case of a commercial fire happening, you could quickly pull out your phone to dial 911. While you may feel inclined to be a hero, the fire department knows best and are well-trained. Call out to the victims trapped in the burning building. Don’t prolong this process. Did you know that surviving third-degree burn is possible, but smoke often kills people? You don’t want the smoke to filter through your lungs. If possible, find a damp cloth to cover your mouth and nose so that breathing won’t be difficult. The palm of a hand is susceptible to burning. If you can feel the heat emitting from a door, then don’t open it. Try to find another way to get out of the building. In the case of a commercial fire, most buildings have an emergency fire escape route showcased. If you can open a door safely, don’t close it. Firefighters need to be able to maneuver through the building. If a building is burning, you need to exit as soon as possible. Take the stairs and not the elevator. Don’t go up the stairs for any reason whatsoever. If you can see anyone in your path, grab them, but don’t spend time moving away from the building’s exit. If you believe that you can safely look for a person without losing your life, do so. Once you have grabbed the person, move as fast as you can and leave the building. A golden rule of thumb is never to reenter a burning building. This entry was posted on Thursday, April 11th, 2019 at 2:39 pm. Both comments and pings are currently closed.